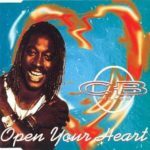 I was surprised to see recently that radio plays for “Open Your Heart” are stronger than any other CB Milton track. I still think it’s a great song, which is a combination of CB’s fantastic singing and the fact that Phil, Peter and I put together a pretty cool song (we also wrote some duds, but allow me to enjoy my little moment of self-satisfaction on this one at least). Like every track we did for CB, the idea was to combine his soulful voice with a strong melody and that thumping big Eurodance/House sound. The lyrics are pretty straightforward, I think – the tale of a guy who feels that things are slipping away and asks for his companion to trust their feelings. I’m not sure I recommend doing this in real life as we are often surprised by what lies in peoples’ hearts! But it makes for a good enough song lyric. If you want to cover this song, get in touch. Open your heart, open your heart to me? Is there a word I can say? A word that will make you stay? Has something gone wrong, has something got in your way? People meet, people part, surely we can make it through? amazing song by cb million and awesome song lyrics. Love this song ,awesome song lyrics. Your blog has always been a good source for me to get quality very useful article. thanks for sharing this.